I’ve never known of anything that can cause more problems in a cat’s life. Litter box use can be a major source of frustration, worry, and for some it can be the reason why cats are surrendered to shelters. Add to all of that the fact that finding the right litter box for your CH cat can be nearly impossible. With our Ellie, we tried three different litter box solutions while she grew up. We never really did find an ideal one for her as a kitten. Eventually, when she grew taller, she was able to use the “big kid”-type litter box that our CG uses. But for most people, testing multiple litter boxes – if you can even find them – can not only add up financially, but also cause significant stress as you live through weeks of trial and error. Even then, if you do end up finding a litter box that works, problems may still occur. For example, most regular litter boxes have entries that are too high for some CH cats to manage easily. Other litter boxes are too small, especially for cats who may go to the bathroom on their side. Some litter boxes are quite light and can easily be tipped over by a wobbly cat. Others that have low entries or an open top can lead to huge messes. And those are just some of the issues you may encounter. Fortunately, there may be a solution. The project involves transforming large plastic storage boxes, like Rubbermaid or Sterilite, into litter boxes by cutting a custom-sized entry hole in the side. The site offers step-by-step directions along with suggestions and lessons the author learned while making several of these. This idea is just brilliant for several reasons. Depending on your cat’s age and ability, you have many options. The author says while 18-gallon boxes work, 30-gallon boxes are even better. One of the many pluses to using plastic storage boxes is that these boxes are super easy to clean. You can wash and bleach them without an issue. Again, these projects may take a little know-how of someone familiar/comfortable with tools. 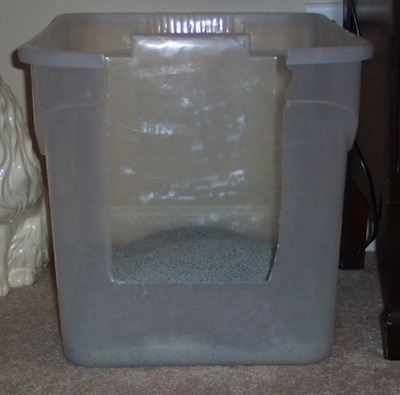 Yet the process is rather simple (and fortunately storage bins can be affordable), so it’s definitely a project worth trying if your cat is having litter box problems. Again, for all of the detailed instructions, please visit the Cats Adored site. The whole process is explained simply with many visuals to guide you. Have you created a customized litter box for your cat? Do you think you’ll give this project a try? Please share in the comments! It is simply gigantic, it’s got high sides, and the edges are all curved. One side has a slight scoop on it, Chairman has been doing much better with this one. It’s darn near impossible for him to fall out while he’s doing his business. My 2ch cats lie on their sides when using the box. I got a long not high plastic storage bin. Like an under the bed sweater container. Cut out a notch on the long side just wide enough for them to fit. Also to keep the flow of urine away from them I make a groove or trench in the little at the spot where it goes. It works great. But there are still those occasions they will step in it. Hope this helps someone..
Princey is great at getting in the “low front” box which I found at PetCo. He urinates in the box, thank goodness. However, he does not poop in the box. I have a large throw rug in front of the box and luckily he usually makes it on that. I was wondering if anyone else had this problem with their CH kitty?? I was hoping to find a solution for him also pooping in the box but from all I’ve seen on the CH site, I guess I should be lucky he doesn’t need diapers!